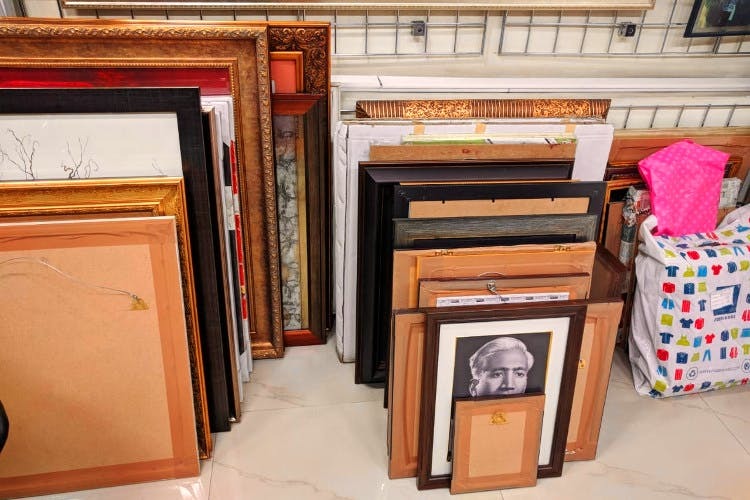 Royal Frames in Koti will fix all your framing needs. Pick borders, frames, and get pictures of your beloved framed at this store. Although located on the main road of Koti, Royal Frames is a hole in the wall place that can be easily missed. Walk into the store to find yourself surrounded by not just framed photographs but paintings too. The entire store is filled with various varieties of frames and borders — wooden, metallic, vintage. They also add borders with intricate carvings for mirrors so you can get a regal-looking one for your bedroom too. The price range starts at INR 300 which is for A4-sized pictures or paintings, and the prices vary according to the sizes. However, we were told it can go upto INR 5,000 based on our choice of frame, but these are mostly for huge frames. Looking to frame a memory? Now you know where to go! It has no parking facility, so you might have to park your vehicle at a distance and walk up to it. Royal has branches all across the city and all the outlets have their classic frames and borders. So, pick whatever is close to you and get there.